Two Sheet Drawing set available from Reeves (2000), cat no 29/501. sheet 2 : Arrangement of cylinders with loose eccentrics and link motion. The constructional series appeared in English Mechanics between 8th December, 1939 and 26th April, 1940. The present abnormal conditions have automatically divided our locomotive building readers into two classes; those who are carrying on much the same as usual, and have their ordinary amount of spare time available for their hobby, and those whose spare time is considerably "rationed" owing to extra routine work, A.R.P. or other duties, etc., yet still find time to do a little in their workshops. One thing applies to both classes; busily engaged in your workshop, you can forget all about the "black-out" and everything connected with it, and derive much benefit thereby. There are also some readers who have had to curtail expenses, and "cut down" on their hobby allowance, but still wish to continue building. It is our worthy Editor‘s earnest desire to cater for all our readers as far as possible, and to this end he wishes me now to describe some type of locomotive that would suit everybody‘s time and pocket. The result of my endeavours to meet his request, is the following description of how to build a Great Western saddle tank, either fully detailed or considerably simplified. 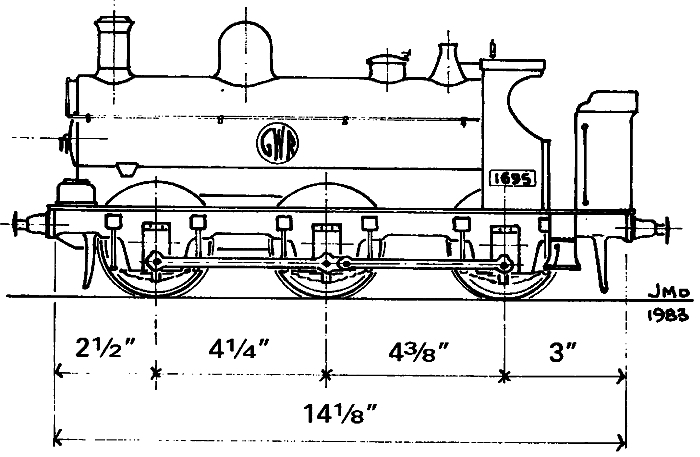 The engine illustrated, will be familiar to everybody living on or near the Great Western system. There are hundreds of them in service, shunting in goods yards, engaged on transfer work, short distance goods hauls, and even on certain local passenger trains. They are exceedingly powerful and efficient for their size, and have a very massive, solid-built appearance. They vary a little in dimensions; 1695 herself, is one of the larger type, and I would particularly call attention to the fact that a "small sister" is exactly to "scale" size in all her main external dimensions. The "internals" vary, as I have endeavoured to work in the castings and parts which can be supplied from stock, by our advertisers; and to meet the needs of "time and pocket," I shall describe two versions of the same engine. One will be the full "regulation" kind, with double frames, ordinary inside cylinders and motion, and a coal-fired loco-type boiler. The other, which will be exactly the same externally, will have exceedingly simple "works" and a boiler fired by oil or spirit. The sizes given are for 2½-in. gauge. The "regulation" construction can be doubled if desired, giving am exceedingly hefty 5-in. gauge job comparable with "Eva May" described in past notes. The "simple edition" can be halved if required, giving a pretty little engine, true to type, capable of hauling a long train of wagons around the sharp curves of an indoor O gauge "scenic" line.